In a land and at a time known for its tough and colorful characters, William A. "Bigfoot" Wallace felt right at home. During his sixty years in Texas, he set the standards as a ranger, backwoodsman and folk hero. Born in Lexington, VA on April 3, 1817, Wallace grew up and worked on his father's fruit orchard. But after his older brother and a cousin died in the Goliad Massacre in the spring of 1836, William decided to join the Texas Revolution to avenge the deaths. He would have to wait, however, for by the time he arrived, the Texan's war for independence had already been won. Wallace first settled near LaGrange. In 1840, after Wallace had been in Texas for over two years, he decided to help in the layout and construction of the new capital at Austin. While there, it is said, he was once misidentified as an Indian, named Bigfoot, that had ransacked a neighboring settler's home. After finding that Wallace's foot was actually smaller than the 14-inch imprint of the Indian, he was found innocent of the misdeed. As a result of the episode, however, Wallace acquired the nickname of Bigfoot, and the name stuck. Bigfoot participated in a number of the early Texas conflicts. He fought in the Battle of Plum Creek in 1840, and against Mexican General Adrian Woll's invasion of Texas in 1842. Later that year, he volunteered for the retailatory Somervell Raid across the Rio Grande River, and subsequently joined the Mier Expedition organized to penetrate further into Mexico. Wallace survived the Black Bean executions that followed the capture of the Mier participants, and was imprisoned at Perote Prison east of Mexico City. After his release, he joined other Texans in the Mexican-American War. In the 1850s, he commanded a company of Texas Rangers fighting border bandits and Indians on the frontier. 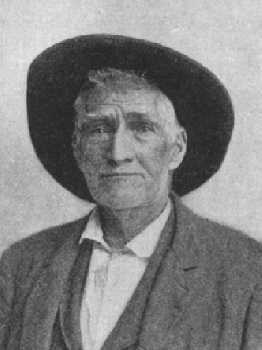 Wallace lived a long life and spent his declining years in Frio County. He enjoyed telling stories of his past, frequently with much embellishment and humor. The publication of some of these stories in 1870 by biographer John Duval contributed to Bigfoot's reputation as a Texas folk hero.